Highly concentrated natural ingredients balance the skin in a gentle manner. Wonderfully soft and smooth skin. The creamy foam cleans, protects and nourishes the skin deep into the pores and improves the skin overall. Dermatologically tested*. Very economical, for up to 200 applications. 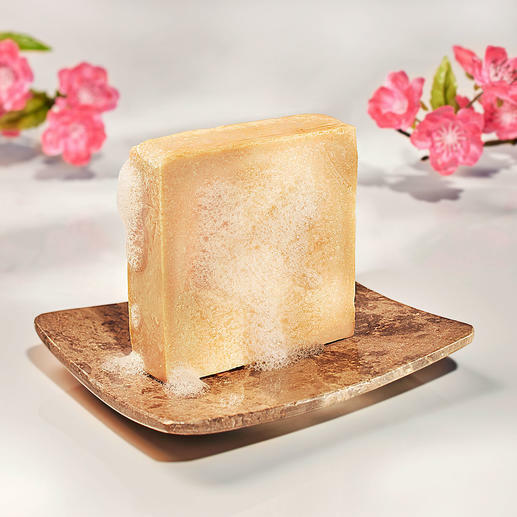 Ingenious milk soap: The essence of thousands of years of proven beauty care. Even legendary queens in ancient times chose a milk bath as their daily skin-care regime. According to tradition, this was to help preserve their beauty. After 10 years of research, it is now possible to create a bar of soap with the skin-care properties of milk. The special feature of the milk soap is its elaborate manufacturing process, which results in a particularly high proportion (16.7%) of natural amino acids and oligopeptides. The abundance of oligopeptides activates collagen and cell formation and thus regenerates the skin. The multiple valuable protein building blocks reduce dehydration of the skin and contribute to the natural protection of the acid mantle. Biological enzymes fragment the amino acids into tiny pieces. This enables the skin to absorb and use them better. Even brittle skin recovers and will feel soft again. Vitamin-rich olive oil has a hydrating effect and keeps the skin supple. Castor oil provides for the fine foam, while the subtly scented coconut oil makes the soap wonderfully soft for your hands. Surfactants clean the skin deep into the pores. Suitable for all skin types. Also perfect for removing make-up. Each piece of soap varies in shape and size, but measures at least 7 x 7 x 2cm (2.8" x 2.8" x 0.8") and weighs at least 125g (4.4 oz). * Derma Consult GmbH, Germany, certified from 18.11.2016.